The sounds came from an estimated 10 to 32 miles away and the ship headed west, she said in a blog entry. After four and a half hours, despite the presence of minke and humpback whales, and only a few calls from the right whales, the rare animals were spotted. The two right whales are part of the eastern stock that number just 30 to 50 whales, said Phillip Clapham, head of the cetacean program at NOAA’s Alaska Fisheries Science Center in Seattle. A French whaling ship recorded the first kill in 1835 and reported seeing “millions” of others. That claim was exaggerated but it drew hundreds of other whalers to the Gulf of Alaska and the Bering Sea, Clapham said. 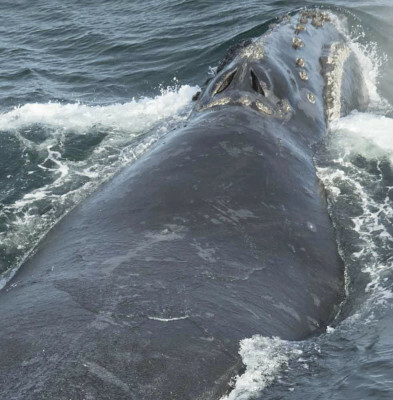 The right whale sampled Sunday had been seen eight times before, Clapham said. The last time was a decade ago. A biopsy sample, he said, can positively identify the animal, reveal its gender, indicate whether it’s pregnant and reveal information on diet and reproductive hormones. “We don’t know what habitats continue to be important to the species,” Clapham said.